Commentary: Boosting LA’s grad rates is about more than education. It’s tackling inequity head on and giving students the support they need. Dou’Jae Rice graduated last year from Hamilton High School and is finishing her first year at UCLA. When Dou’Jae Rice’s father was killed during her sophomore year of high school, the pressures of providing for her family could have forced the straight-A student to drop out. But that didn’t happen. 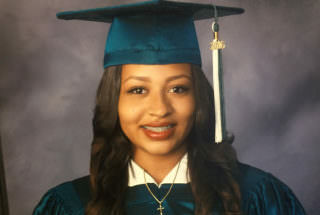 Instead, Dou’Jae was able to tap into a network of support at LAUSD’s Hamilton High School that kept her on track to graduate. Today, she’s wrapping up her first year at UCLA and plans to become a lawyer representing low-income people. Like Dou’Jae, so many students in Los Angeles face daunting obstacles every day. Many don’t know where their next meal is coming from. They struggle with homelessness. They bear witness to violence at home or in their communities. They miss weeks of school each year because of illness or family obligations. And layered on top of all of this are historic and systemic inequities — tied to race, immigration, and policing — that lead to poverty. It should come as no surprise then that tens of thousands of students in LA — particularly students of color in low-income neighborhoods — struggle in school and are at risk of dropping out. Unlike Dou’Jae — and despite the compassionate and dedicated efforts of teachers, counselors and principals across the district — too many are unable to get the services and attention they need to stay in school and graduate. The barriers thrown up by poverty are a real problem for students in the Los Angeles Unified School District, where about 75 percent of students qualified for free or reduced-price meals in 2016-17. Though graduation rates have risen since 2010, nearly a quarter of students don’t graduate from high school within four years. Too many young people are being left behind, and that’s just not acceptable. Yet as Dou’Jae’s story illustrates, young people can get the help they need to succeed. At Hamilton and nine other LA schools, a partnership between the school district and the nonprofit Communities in Schools of Los Angeles (CISLA) has achieved stunning results through an approach called Integrated Student Supports. Among participating students at all 10 schools, 93 percent of seniors graduate high school in four years. Results can happen relatively quickly too. At Mendez High School in Boyle Heights, a partnership among school leadership, CISLA, and the Partnership for Los Angeles Schools has boosted the graduation rate 46 percent in just four years, to 96 percent. In the Integrated Students Support model, trained professionals are placed in the schools all day and after school to connect students with mentoring, tutoring, enrichment programs, mental health services, clothing, and other services tailored to their unique needs. Each of the schools’ principals works closely with the nonprofit’s staffers to figure out what school-wide issues the principal wants to improve, such as attendance, school culture, or family engagement, and to target those students most likely to drop out. Integrated Student Supports makes deep economic sense in these times of shrinking budgets for education and social programs. For every dollar invested in the CIS program in California, $38.40 in public and private benefits is returned. More investment in supporting our students could change the trajectory of kids’ lives — and of our community as a whole. Because when students do better in school and are better prepared for life and careers, that’s a win for everyone: kids and their families, communities, and businesses. So what’s next? The LAUSD Board of Education should commit itself to addressing the underlying, systemic inequities that keep kids from graduating. The city’s business leaders — as some are already doing — can promote supportive programs for students, from career days, internships, and science and technology enrichment to weekend camps that give students their first chances to get out of the city and see the stars. They can help students see what’s possible in their lives. And schools, communities, and businesses can work with parents, providing them with the supports they need to raise their families out of poverty. There’s no silver bullet, of course. And Integrated Student Supports are a solution most people don’t think of as education reform. But that’s what we need: holistic approaches that deal with the reality of young people’s lives and use caring adults as a key complement to the vital educational work already happening in schools. With their communities solidly behind them, students like Dou’Jae can thrive in every way. Deborah Marcus is executive director of Communities in Schools of Los Angeles, which is celebrating its 10th anniversary.